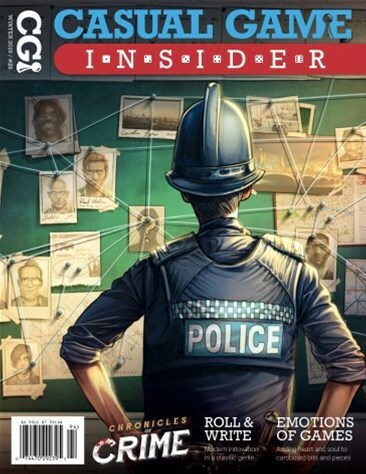 Chronicles of Crime by Lucky Duck Games combines the best in game components and mobile technology to deliver a unique cooperative game of crime investigation. Plus: the rise of roll and write games, the emotional connections of board gaming, Essen SPIEL 2018 highlights, how Keymaster Games has unlocked the potential of gateway games, and Torpedo Dice — a roll and write game designed exclusively for Casual Game Insider. This issue also features reviews of Fungeon Party, Villainous, Between Two Cities, Decrypto, Kung-Fu Zoo, Visitor in Blackwood Grove, Junk in My Trunk, and a special review of Monster Crunch by Major Fun.